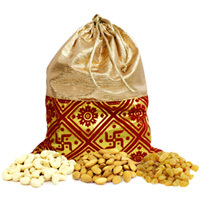 Browse our online shopping portal and Send Dry Fruits to India for various gifting occasions like Diwali, Holi, Raksha Bandhan, Christmas, New Year and make your loved ones feel happy and special on any day you want. 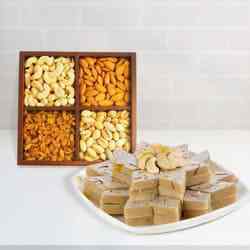 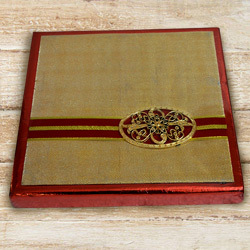 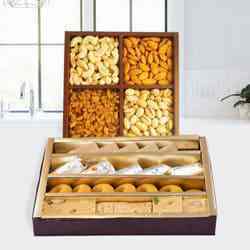 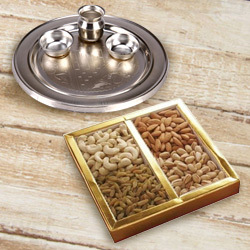 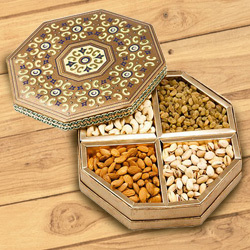 Whether you want to congratulate someone or wish to send warm festive greetings, Sending Dry Fruits Gift Tray to India can do wonders and reignite your relation with infinite sparks. 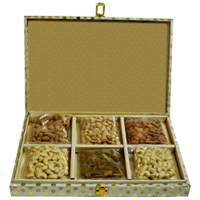 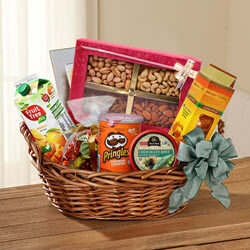 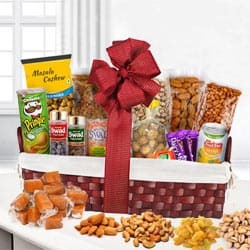 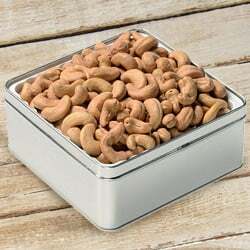 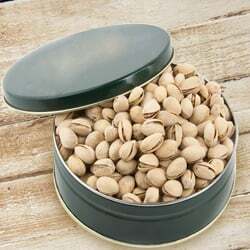 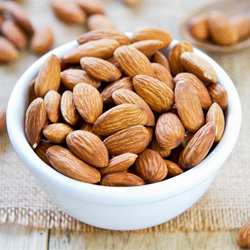 Our website offers best quality of Assorted Dry Fruits like Almonds, Pistachios, Cashews, Mixed Nuts, Walnuts, Raisins, Apricots etc at affordable price that comes beautifully decorated in basket, trays and pallets with designer Gift wraps. 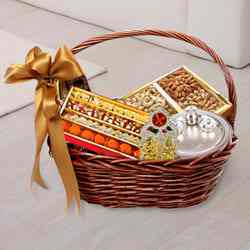 You can also pair up your chosen crunchy Dry Fruits Gift with Mixed Roses Bunch, Seasonal Floral Bouquet, luscious Cakes, Cadbury Celebration Pack, Assorted Sweets, Silver Plated Thali, Personalized Messages Cards and many more items to make online gifting more essential. 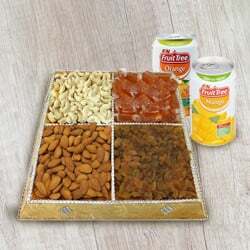 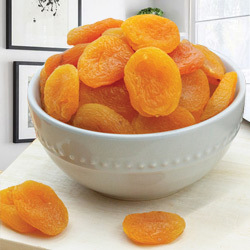 Place your order today and Send Assorted Dry Fruits to India for free delivery at low cost from USA, UK, Canada, Australia, Malaysia and from any other country across the world. 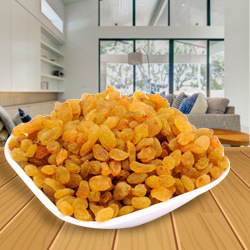 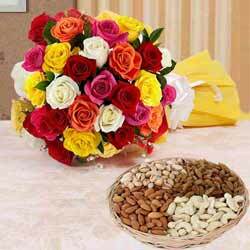 Send Dry Fruits to India Online and greet your health-freak friend on Baby-shower, House-warming, Raksha Bandhan, Diwali, Bhai Dooj or for many such occasions. 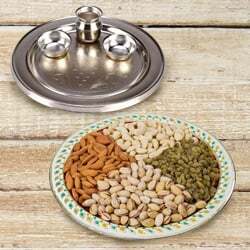 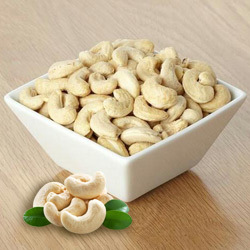 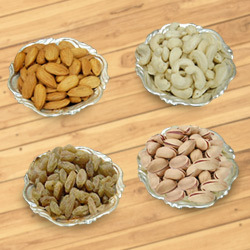 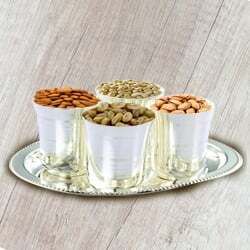 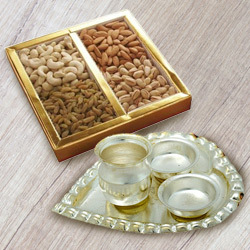 At our online shopping portal, you can look for stupendous range of delectable Dry Fruits such as pack of Masala Cashews, Combo of Silver Plated Puja Thali with Assorted Dry Fruits, Mixed Dry Fruits in Silver Plated Bowls (Almond, Raisin, Apricot, Cashew), special Silver Plated Pooja Thali with Mixed Dry Fruits N Haldirams Kaju Katli, indulgent treat of Chocolates N Dry Fruits Assortments and many more that you can order online and Send Assorted Dry Fruits to India on the same day and even at midnight to more than 500 Indian cities and locations; courtesy our indiawide delivery network. 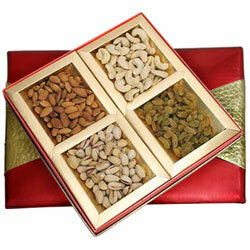 So, choose your preferred Dry Fruits Hamper and feel free to Send Dry Fruits Tray to India to mark your celebration with a tinge of good health. 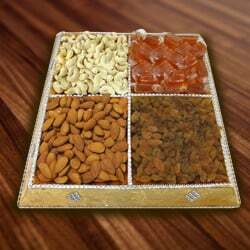 Turn every small and big occasion of your life into a perfect celebration, as you Send Dry Fruits to India at cheap cost for family, friends, colleagues and close one which is a fistful of good health and taste. 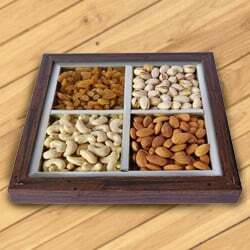 If your loved one is a health-freak and do not prefer to eat any processed food, then Sending Assorted Dry Fruits Tray as gifts for them in India is definitely the best bet. 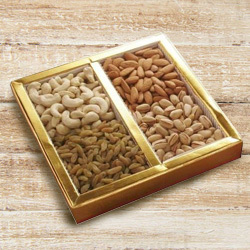 Browse our online shopping portal and order from our catalogue of Dry Fruits Assortments like Cashew Nuts, Almonds, Pistachios, Raisins, Apricots, Walnuts etc. 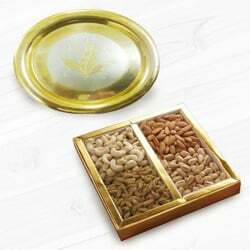 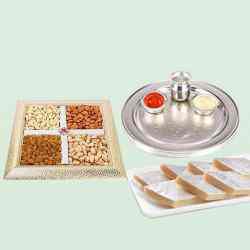 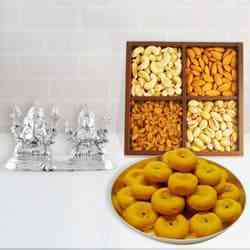 You can also add Golden Plated Thali, Silver plated Glass and Tray Set, Assorted Haldiram Sweets, Chocolates and designer Floral Bouquet with well decorated Dry Fruits Tray and get Same Day Delivery of Mixed Dry Fruits to India at low cost through our reliable website. 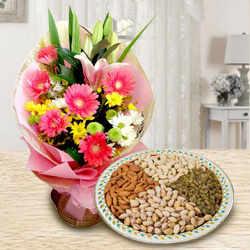 Flower to Mahendragarh, Send Gift Dewas, Sending to Trivandrum, Send Flowers and Gifts to Udhagamandalam, Goa Online Cake Delivery, Send sweets Thiruvarur, Birthday Delivery Sangli, Diwali Mithai Hosur, New Year Flowers Varanasi , Flower shop Panaji, Online Shop Pimpri, Wedding Cake Vijaywada, Fresh Fruits Delhi, Sari Delivery Lalitpur, Watches to Pali.